Some of the dishes were absolutely fantastic. But, there were genuine weak points too. Three years ago Alexis Gauthier bought Richard Corrigan’s Lindsay House and put his own name above the door. A string of accolades followed but they lost their Michelin star in 2012 and have had mixed reviews of late – despite his own growing renown. We were surprised to find you have to ring the doorbell to get in. It’s quite a nice touch and adds to the sense of occasion. I’m sure it sure it keeps most of the riff-raff out too. Unfortunately, the lady who answered the door came across rather snootily and didn’t even acknowledge me. I may as well have been invisible. In fairness though, the rest of the staff we brilliant and more than made up for their colleague’s bad attitude. We were led upstairs and into a small, plush dining room which holds about ten tables. It felt very intimate but the atmosphere was subdued to the point where we found ourselves feeling the need to whisper. We quickly decided to mix-and-match four plates each from the a-la-carte, as opposed to the tasting menus. The first nibble of note was the pre-starter of crispy fried chicken skin with herb puree – seems like junk food likes to follow us into the most unlikely of places. Junk food inspired or not, it was delicious. I began with yuzu & miso curd, while the my dining partner went for the terrine of duck foie gras. The yuzu was a very special dish. 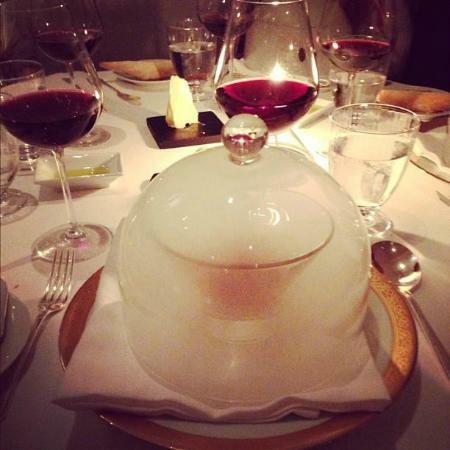 It arrived theatrically in a glass cloche full of smoke, which was totally unexpected! I’m pleased to say that it tasted fantastic too. There was plenty of seafood and you could detect the smoke but it was still quite subtle. The foie gras dish was more of a classic combination, with sweetness from the port jelly and crunch from the toasted brioche perfectly complementing the rich terrine. My second course was roasted Scottish scallops, which were perfectly cooked and tasted absolutely delicious. The poorest dish of the evening by some distance was the Atlantic halibut. The fish itself was well cooked, but to our surprise there was a herb crust. It tasted of nothing and had a sticky, cloying texture that made it impossible to eat. When I tried some, it got stuck around my front teeth, which wasn’t a great look (given that it was green). Whoever was manning the pass needs to hang their head for allowing this one to slip thorough. I’m pleased to say that the meat dishes were better. Cuts of Highland venison was cooked perfectly pink and full of flavour. 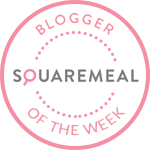 One problem though – the celeriac puree. Garlic puree would’ve been a more accurate name for it. When eaten with the venison it totally overpowered the meat. I really enjoy garlic and didn’t find it unpleasant, but the celeriac was totally lost. The Canette Des Dombes comprises of two cuts of duck; a honey glazed breast and a braised leg. The breast was soft, pink and succulent but the leg was cooked to the point where it was verging on dryness. Half a good dish. For dessert, we ordered the Golden Louis VX and strawberry millefeuille with lime sorbet. Both were outstanding and a really great way to end our meal. The Louis VX is Gauthier’s signature dish and is as good a dessert as I can remember. It was decadent, rich and delicious; with the crispy sweetness of praline, sticky dark chocolate coating and soft mousse all working perfectly together. The millefeuille was a very summery dish, perfectly light and fresh. The macerated strawberries had an almost melt-in-your-mouth quality and offered just the right amount of sweetness. We enjoyed a lot about our evening at Gauthier. Some of the dishes were absolutely fantastic. But, there were genuine weak points too. I’d be really interested to hear from anybody else who has tried the herb crusted halibut. Mistakes like this shouldn’t happen at this level – it’s just sloppy and perhaps shows why they are currently starless. 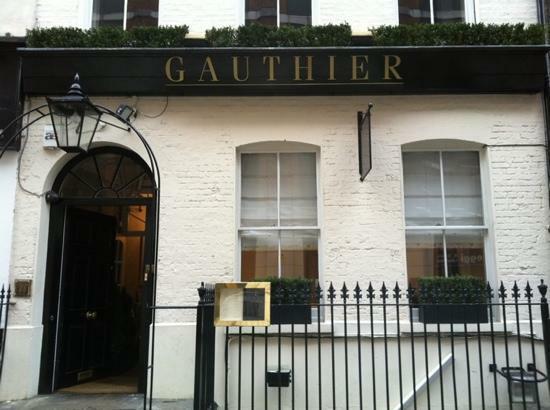 Gauthier is a good option for vegetarians and they even offer an entirely meat-free tasting menu – apparently. One thing I will hold against them is the fact that they include calorie information on the menus. I don’t know about you but I just don’t want to know. I want to have fun when I eat out – not feel guilty. Anyway, we’ve chosen not to share it with you, just in case it spoils your enjoyment of the Louis XV, which really was the star of the show. Four courses including aperitifs and a few glasses of wine (you won’t find a bottle for less than £35) cost just short of £160.